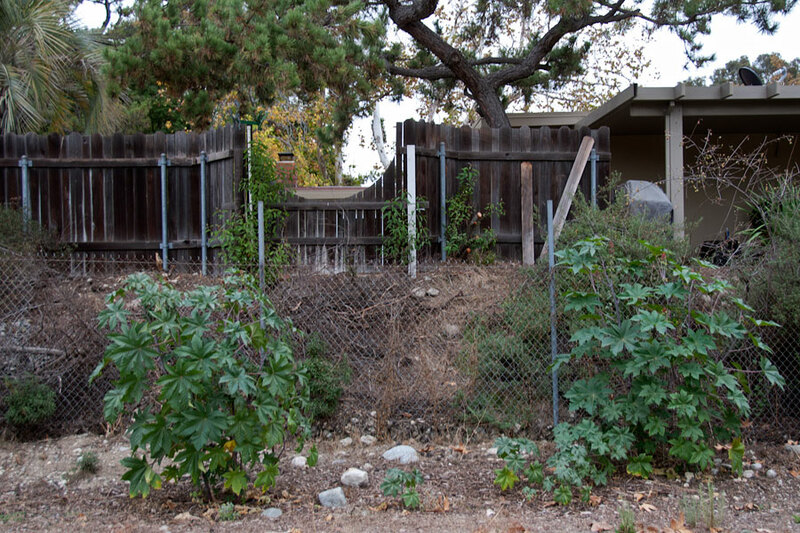 Because the BFS ‘Neck’ is long and skinny, with a lot of “edge” relative to its area, non-native ornamental plants have entered the Neck from adjacent yards, and at last Saturday’s workday, volunteers removed a number of these invading plants from the lower part of the Neck. 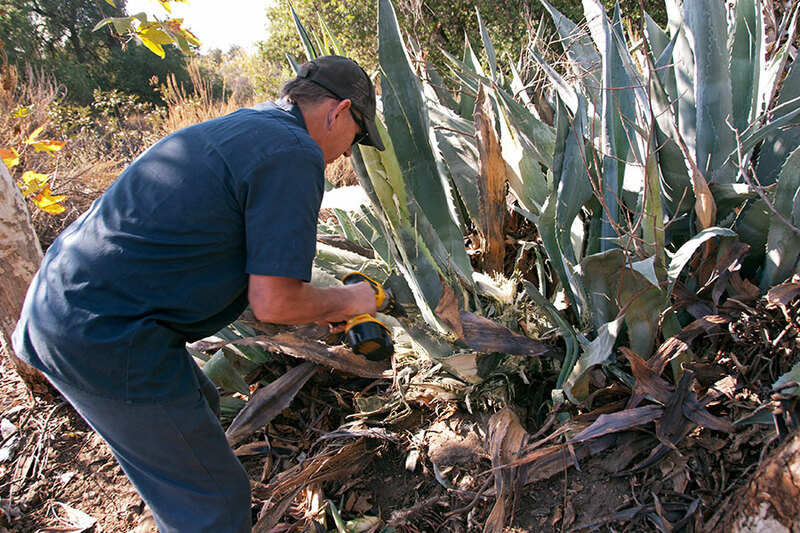 Century Plants (Agave americana) in the Neck. ©Nancy Hamlett. 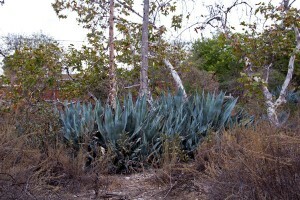 These large, blue-gray, spiky Mexican natives grow well in Southern California, where they are commonly used as accent plants in the landscape. 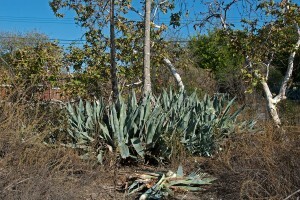 When a plant is 10–30 years old (“century” is an exaggeration), it produces a tall flowering spike and then dies, but produces “pups” – new plants that arise from the roots. 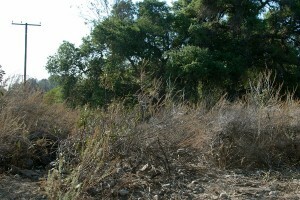 Just a few years ago, the two plants in the Neck flowered (you can see the two tall stalks in the photo above), and there is now a thicket of Century Plants displacing the native flora. The volunteers began by digging up small plants, then cutting off leaves of larger ones and digging up their roots. 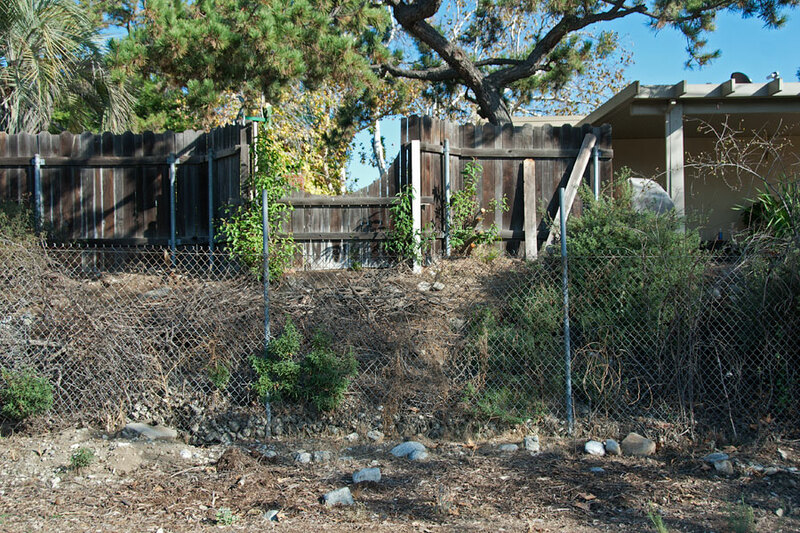 Victoria Porras (Mt. Sac) and Brandon Peterson (Mt. Sac) dig up Century Plants. ©Nancy Hamlett. Ben (Mt. 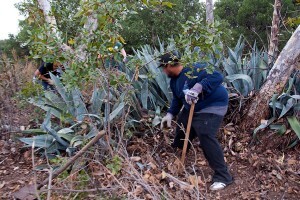 Sac) digs up Century Plants from the edge of the stand. ©Nancy Hamlett. 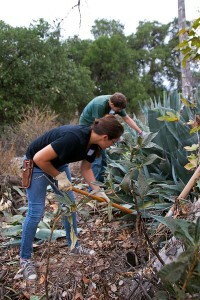 Desiree Lopez (Citrus College) carries out Century Plants. ©Nancy Hamlett. 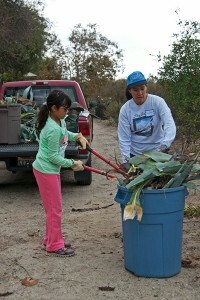 Elena assists Gloria Cangahuala in cutting up Century Plants for disposal. ©Nancy Hamlett. Once smaller plants were removed smaller plants from the edge of the stand, holes were drilled in the “hearts” of the larger plants with a cordless power drill with a really long bit. 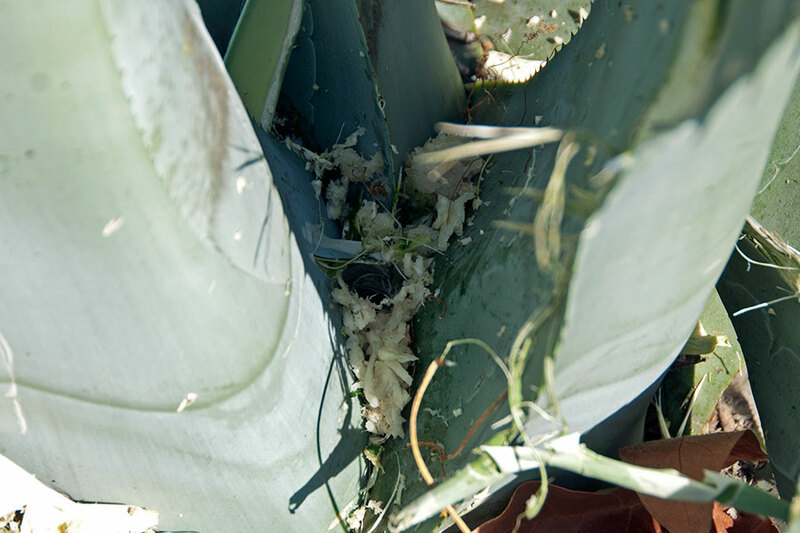 The idea is that the holes allow the inside of the plant to become infected, and the infection eventually rots the entire rosette. This is the first time we’ve tried this method at the BFS. We’ll let you know how it works! 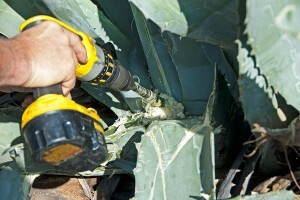 Tim Cox drills holes in Century Plants. ©Nancy Hamlett. Drilling a hole in a Century Plant. ©Nancy Hamlett. Holes in the base of a Century Plant. ©Nancy Hamlett. Century plants with some of the outer plants removed and holes drilled in the rest. ©Nancy Hamlett. 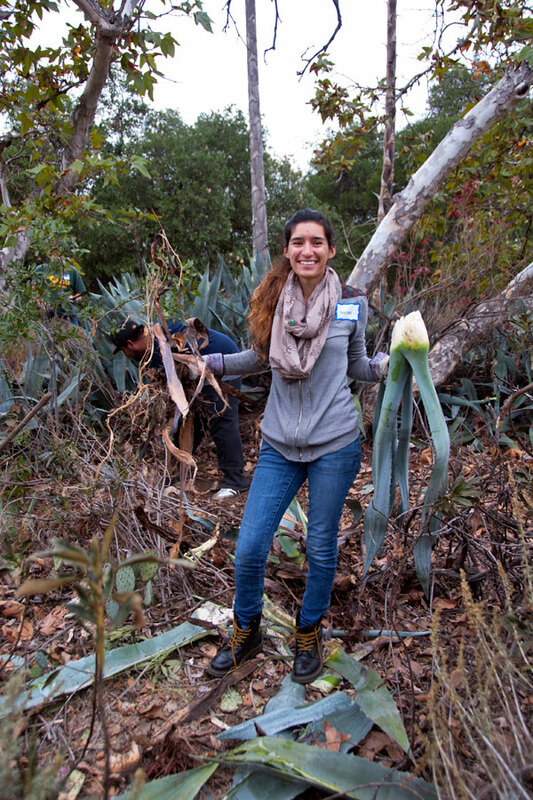 Volunteers also removed some Cereus sp. cactus growing next to the road. 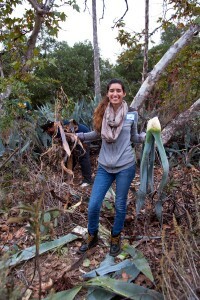 Cereus sp. 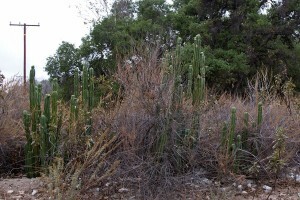 cactus growing next to the road. ©Nancy Hamlett. These large, columnar cacti are native to South America. Their sculptural form and lovely night-blooming flowers make them attractive landscape plants. At the BFS, however, they are spreading and displacing native plants. Volunteers cut the off the stems, then dug up the roots. Volunteers chop up Cereus cactus and put the pieces in cans for disposal. ©Nancy Hamlett. 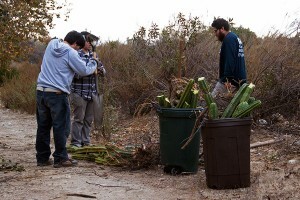 When they were done, there was nary a Cereus to be seen. 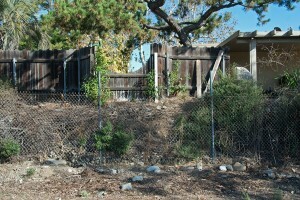 No more Cereus! ©Nancy Hamlett. 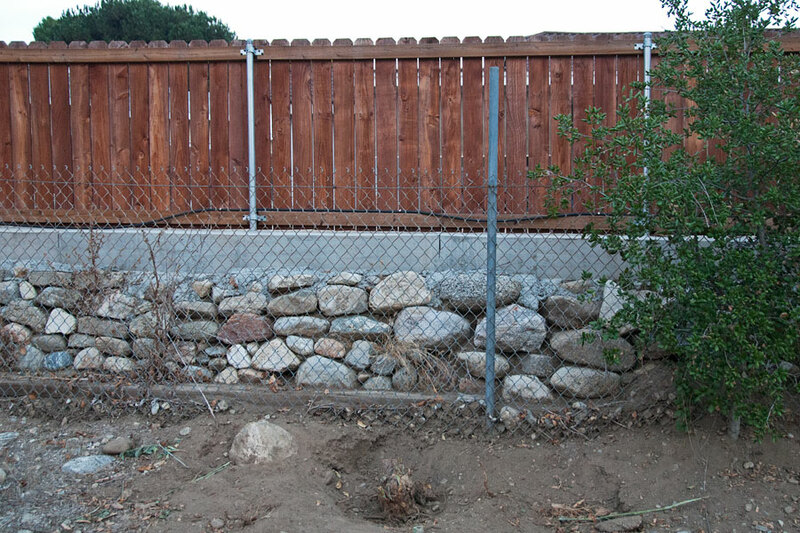 The volunteers also dug up several Castor Bean (Ricinus communis) plants growing next to the fence. Castor Beans, which are native to warm parts of Asia and Africa, make interesting landscape plants, but they are highly poisonous, especially the seeds. The poison is not only toxic to humans, but also to animals ranging from cattle and horses to cats, dogs, rabbits, gophers, chickens, ducks, and even aphids and nematodes! Not something we want at the BFS! Castor Bean (Ricinus communis) growing next to the fence. ©Nancy Hamlett. 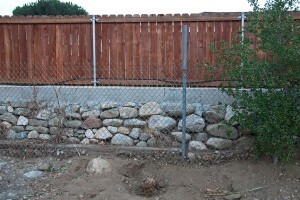 Castor Beans all gone! ©Nancy Hamlett. 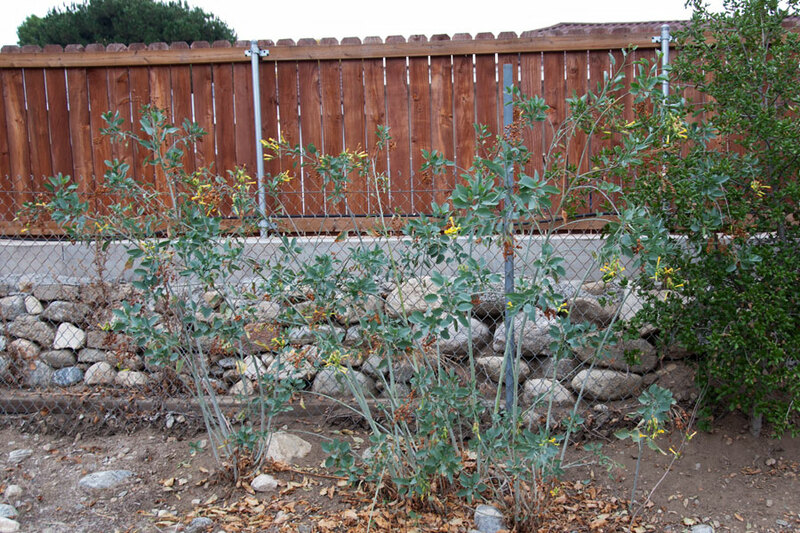 Tree Tobaccos (Nicotiana glauca) were the last non-native plants removed by the volunteers. Native to South American, Tree Tobacco is drought resistant, tolerates of a wide range of environmental conditions, and can outcompete native vegetation, often forming monospecific stands. 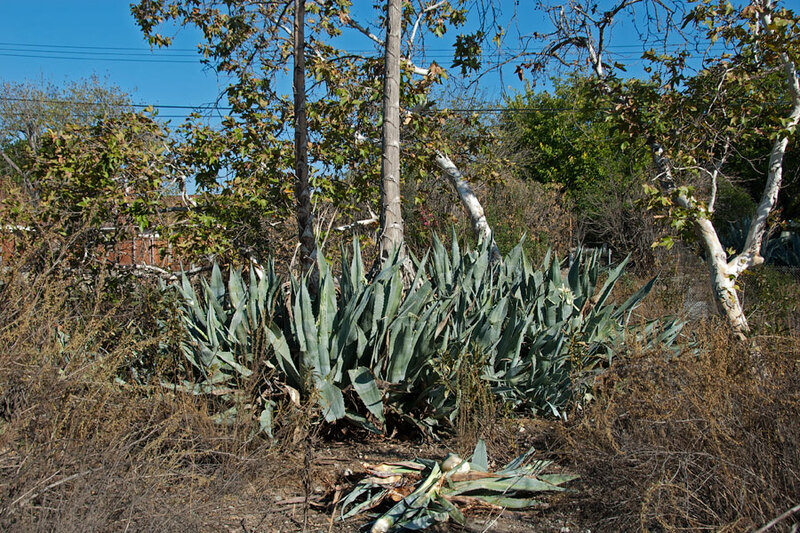 Tree Tobacco also produces nicotine and other alkaloids that are toxic to grazing animals (and people!). Tree Tobacco (Nicotiana glauca) growing next to the fence. ©Nancy Hamlett. Only a stump is left from the Tree Tobacco. ©Nancy Hamlett. Lastly, volunteers picked up some very old (pre-field station) trash, including old bottles, broken glass, rusty cans, old upholstery springs (! ), a tricycle seat (! ), tarpaper, old bricks, pottery shards, etc. Our next workday – the last for this semester – will be Saturday, December 7. We hope you can join us!